For the next two weeks, schools in Tasmania are on holiday so I thought we would take a break from the blogging challenge for just one week. What can I do this week when there is no challenge? Make sure you have checked the student or class list. Are you only listed once and the link to your blog works? To test this out, make sure you have logged out of your blog and testing as if you are a visitor. Can your visitor read your posts and leave comments or do you need to change some settings? Cool blog. Come and visit my blog too. Have you checked out the September Flipboard magazine? Compare these posts to yours – do yours need an improvement? Have you completed the challenges from week 1,2 and 3? Could you improve those posts now that you have checked out some others? If you only joined the challenge in late September, I will not be deleting yours. We try to have mentors for student blogs and if your blog does not work properly or you are not writing posts, then you don’t need a mentor. I can slip another person into your place instead. 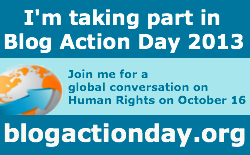 One important activity we do in October is take part in Blog Action Day. Check out their blog, read the instructions, register your blog, add the badge to your sidebar. Start researching the topic and planning your post. Do not publish it though, until the date of the Blog Action Day.